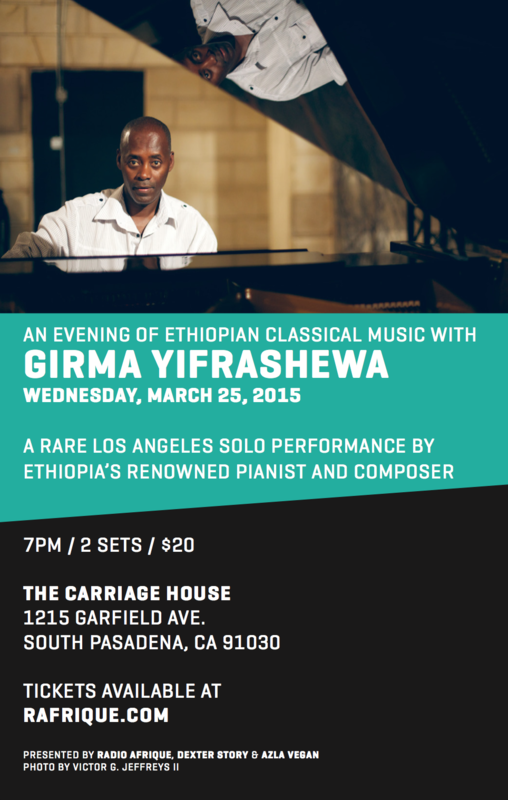 A rare Los Angeles solo performance by Ethiopia’s renowned pianist and composer, Girma Yifrashewa. Born in 1967 in Addis Ababa, Girma Yifrashewa combines the ecstasy of Ethiopian harmony with the grandeur of virtuoso piano technique. Yifrashewa has trained at renowned institutions including the Yared School of Music in Ethiopia, Sofia State Conservatory in Bulgaria, the Royal Academy of Music in London, and the Hochschule fur Music Und Theater in Germany. A highly accomplished performer of classical repertoire, Yifrashewa has chosen to remain in Ethiopia, helping to forge a classical tradition for his country. Currently, Yifrashewa works to promote Ethiopian and Classical Music through cultural commissions and tours throughout Africa, Europe and beyond. This intimate performance hosted at The Carriage House will be Yifrashewa’s only Los Angeles appearance on this tour. We invite you to join us for this truly special occasion. Born in Addis Ababa in 1967, Girma Yifrashewa’s life in music began with the Kirar, a traditional Ethiopian harp. Introduced to piano at the age of 16 at the Yared School of Music in Addis Ababa, he later studied at the Sofia State Conservatory of Music in Bulgaria. When the fall of the Communist regime in 1989 ended his scholarship, he emigrated to Italy, returning to the Sofia Conservatory in 1991 to earn a Masters in Piano under Professor Atanas Kurtev. In Bulgaria he made an impact as a solo pianist, performing the works of Schumann, Schubert, Chopin, and Debussy until his return to Ethiopia in 1995. Since then, Yifrashewa has established himself a pre-eminent composer of Ethiopia, touring Africa and Europe extensively. His first US release, Love and Peace (Unseen Worlds), was released in 2014.